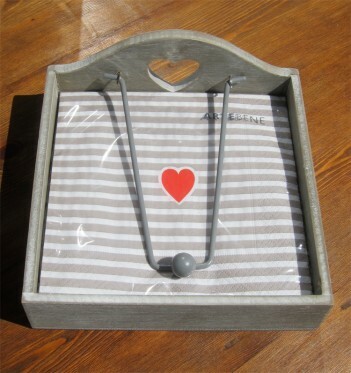 Lovely wooden, paper napkin holder. Metal hinge holds the napkins in place. Measures 18 x 18cm and the main section is 4.5cm deep. With a pretty heart cut out detail. Napkins are not included but we do have a lovely range of napkins to choose from, available in store! Please click on the photos to see alternative images.